Kurt held bears in high regard. 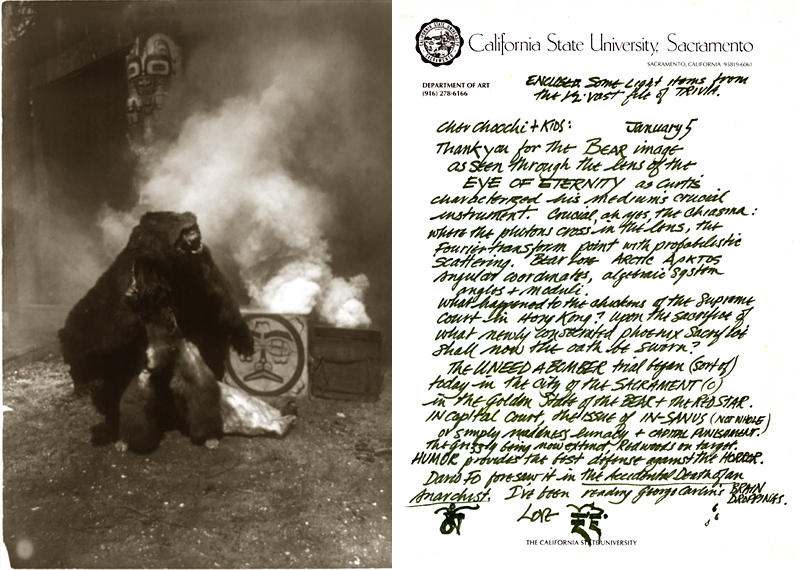 His friend Joe Duane ("Choochi"), who first met Kurt in 1970, sent him the gift of a photograph--Grizzly Bear Dancer, Qagyuhl by Edward Sheriff Curtis--and Kurt sent Joe a note of thanks, dated January 5. The year was 1998, as Kurt's reference to the Unabomber trial indicates, and Kurt's inquiry about "chickens" and the Supreme Court in Hong Kong has to do with historic practices of chicken sacrifice and its connection with honest court testimony. The note closes with Kurt's reference to Brain Droppings, a book by George Carlin; Kurt's signature uses his Buddhist name, rDorje, written in Tibetan. Thanks to Joe for providing this bit of von Meier memorabilia.